As you will no doubt here me say over and over again, fresh herbs make everything better. If there’s a way to use them, use them. Use a lot of them! After all, they’re free flavor! In the spring and summer, when our herb garden is out of control, I can’t use them fast enough. Additionally, hearty herbs such as rosemary and thyme can last well in to the winter. As we all know, winter is soup making time, and these herbs make a great addition to almost any soup. Pick or otherwise gather the herbs you will be using. In this case, I’m using a mix of thyme, rosemary, parsley, oregano, bay leaves and peppercorn. 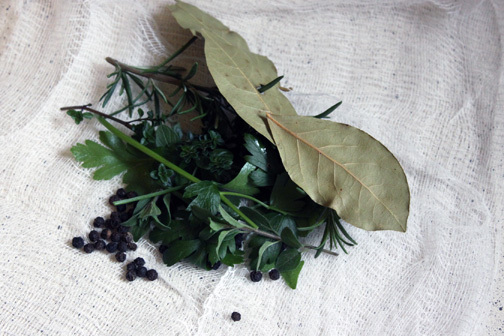 A standard or basic sachet would be thyme, bay leaves and peppercorns. Add what you have. Cut a decent length of cheesecloth. I like to cut a bit extra and fold over extra layers, so the peppercorns don’t fall through the weaving. 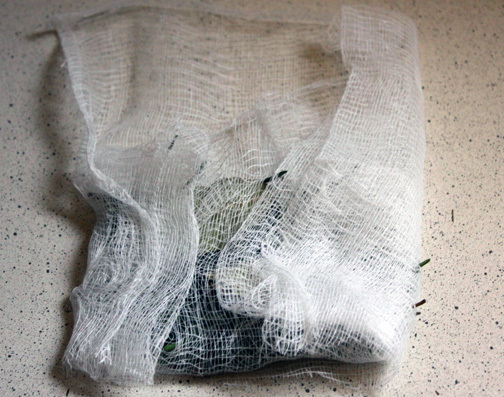 This is especially a problem with cheap, crappy grocery store cheesecloth. 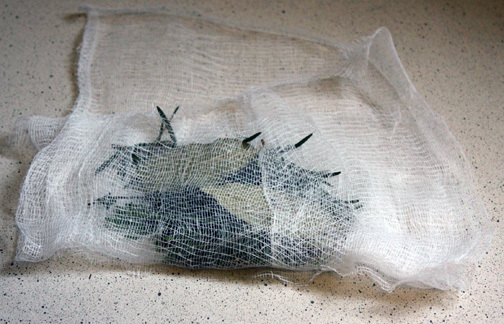 Place the herbs and spices in the middle of the cheesecloth. Fold the bottom of the cheesecloth up over the herbs, fold over the left and right sides, and then roll tightly from the bottom. 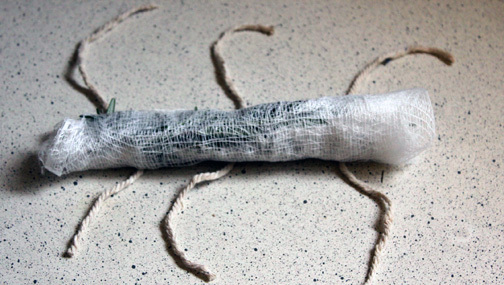 Place the rolled up cheesecloth on three short sections of string, and tie each of the strings. When you are making you soup, sauce, broth or whatever, bring the liquid to a boil and throw in your sachet. This will steep the herbs, and make your kitchen smell like heaven. Your food will taste good too. Enjoy! Very useful post, I love it! You are currently reading How to Make a Sachet at The Evolution of Eating.